The central element in Tenshu General is your Tenshu. A tenshu is the central tower of a Japanese castle during the Edo era from 1603 to 1868. From here you create armies to conquer provinces, suppress rebels and fight enemy armies. 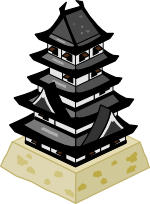 It’s important to protect your Tenshu, to do this in the game you can go to the Tenshu and build additional walls to defend it against attacks. You are the general of the Tenshu and it’s your job to expand the borders of its territory and defeat its enemies. By conquering neighbouring provinces, you can increase your rice income and use it to upgrade your armies. You can also upgrade the production of your villages by spending rice on them. Combine your tactical skills with a good strategy to outsmart your opponents and win the game. Farmers with tools are more effective and increase the quality of the crop. Tools provide a slight increase in overall production. Rice requires a lot of water and therefore proper irrigation is vital to generate a high yield per rice field. Irrigation provides the highest increase in overall production. When villages have oxen to help out with the work, it can be done quicker and more crops can be harvested. Oxen provide a significant increase in overall production. As in any army, the infantry unit is the most common unit on the battle field. They can march for days and use their katana’s to engage the enemy with spirit. These samurai’s on foot fight best when cover can be utilised, so they favour forested terrain. Archers can deliver a rain of arrows, but require line of sight and need cover. That’s why they are at the biggest advantage in mountainous terrain. Archers make great support troops in a mixed army. They could tip the outcome of a battle. Each province has one main terrain type. This terrain type gives bonuses to certain units so you can use it for tactical advantage and strategic defences. By clicking on the terrain icons, the game shows you the bonuses they provide to your armies.